Columnar database systems, designed for an optimal OLAP workload performance, strive for maximum multi-core utilization under concurrent query executions. However, multi-core parallel plan generated for isolated execution leads to suboptimal performance during concurrent query execution. 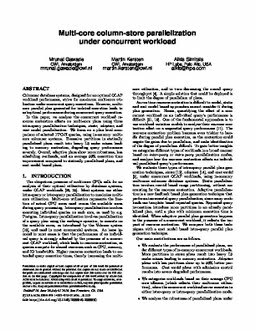 In this paper, we analyze the concurrent workload resource contention effects on multi-core plans using three intra-query parallelization techniques, static, adaptive, and cost model parallelization. We focus on a plan level comparison of selected TPC-H queries, using in-memory multi-core columnar systems. Excessive partitions in statically parallelized plans result into heavy L3 cache misses leading to memory contention, degrading query performance severely. Overall, adaptive plans show more robustness, less scheduling overheads, and an average 50% execution time improvement compared to statically parallelized plans, and cost model based plans.